look good in my 95 nissan pathfinder. thanks! Works good. Built a little cheap but what I expected Thanks. Meh. The fit is loose & not like the pic however it looks better than my worn seat. (See pic)Just needed one but they only come in pairs. Color match is fairly close. Clips haven't come unhooked after two driving trips for errands. 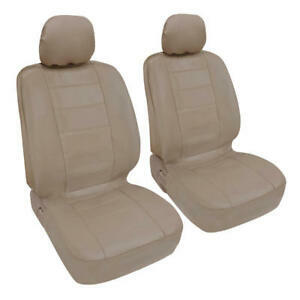 Very good quality, nice fitting, and color matches original seats. Great leather looking front seat covers that look great if you have non sport bucket seats...easy to install and fits tight...no bulging. Good value for the money, the covers fit great and look good. I would buy again from this company. Inexpensive covers, easy to clean , but don't fit fixed headrest like it says. They are really for separate headrest.